What Is DA Form 2125? DA Form 2125, Report To Training Agency is a form used by military students to create a continuing contract with their training agency. 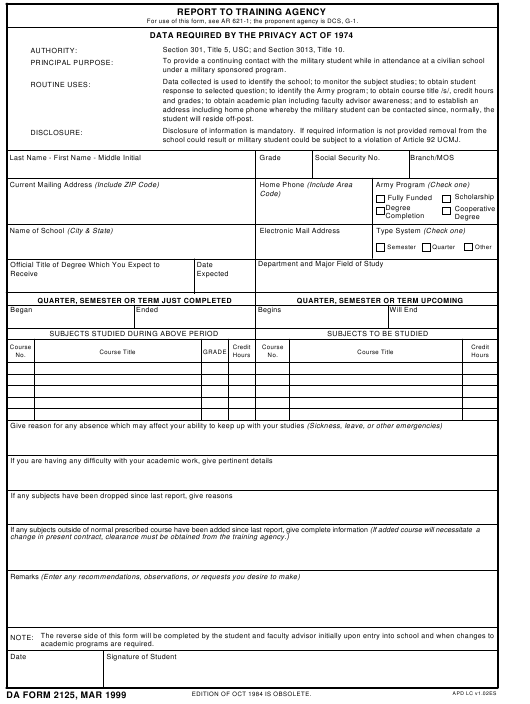 Officers should submit this form after arrival at the civilian school they attend under a military-sponsored program and at the end of each academic term. The DA 2125 is usually submitted with the related DA Form 1059-1 (Civilian Institution Academic Evaluation Report) and degree-awarding transcripts, which are used in the assessment of a soldier's progress. This form and the official transcripts are the only documents that officially reflect a soldier's academic performance while attending school. How To Fill Out Da Form 2125? For use of this form, see AR 621-1; the proponent agency is DCS, G-1. Section 301, Title 5, USC; and Section 3013, Title 10.
under a military sponsored program. school could result or military student could be subject to a violation of Article 92 UCMJ. EDITION OF OCT 1984 IS OBSOLETE. to the original) plan (cross out inapplicable wording.). The DA 2125 should be initially filed after the student arrives at the school. First, the student has to provide their full name, grade, social security number, the branch of service and military occupational specialty. The form also requires the student's current mailing address and phone number with area code. The Army program under which the student is attending school should be specified in the appropriate box. The student has to enter the name of the school, its e-mail address and describe the structure of their participation. They should then specify the official title of the degree they are pursuing, the date of expected graduation, the department and the major field of study. The next lines of the form require the information about the last semester or quarter attended and the closest upcoming one. The student has to fill in the numbers and titles of each course and provide their grades and credit hours. The student then has to describe any difficulties they've had with their academic work - if any - and give reasons for dropping any subjects since the last report. The reverse side of the form has to be filled initially and updated if any changes occur in the academic plan. The final submitted form should contain the thesis or dissertation theme and its short synopsis. The completed DA 2125 Form should be submitted via email to usarmy.knox.hrc.mbx.opmd-army-acs@mail.mil or mailed in to the Advanced Civilian Schools Branch (AHRC-OPL-C), 1600 Spearhead Division Avenue, Dept. 290, Fort Knox, KY 40122-5209.